Proof: Portraits from the Movement 1978-2003 shown at the National Portrait Gallerys Commonwealth Place precinct (12 July  10 September 2003) was an unusual exhibition for a number of reasons. In bringing together Juno Gemess documentation of the Land Rights movement in Australia via the genre of portraiture, it threw new light on her work, radicalised the exhibition space as one capable of addressing serious and central issues in Australian culture, and galvanised a debate about changing national and social values over the last thirty years. Thats no mean feat. Gemes is one of several non-Indigenous photographers who, decades ago, threw her lot in with Aboriginal communities and activists working for fundamental change in Australian culture. Keen to work in partnership with Kooris to redress injustices, Gemes was able to contribute her photographic skills to inform and persuade fellow Australians about a renewed spirit for Aboriginal self-determination. In forging a visual language that engaged with grassroots struggles, Gemes (and a handful of contemporaries) worked within something of a precedent vacuum in Australia, when contrasted with the strong and varied documentary and activist traditions in the US, Russia and Germany in the twentieth century. Local traditions of sullen ethnographic or aestheticised reportage were not up to the task of reflecting the sea-change taking place within indigenous  and some non-indigenous  peoples. In rejecting the enervation of handouts for the empowerment of land rights struggles, compassion was offset by laughter, and creativity complemented by the hard slog of working for personal, community and national change. To capture this sustained work photographically so that those not involved in the struggles might reflect on the issues, without at the same time resorting to aesthetic hyperbole, is a challenge. Gemess images show engagement with individuals and communities where the players are aware of the urgency of the struggle and the power of photography to reveal some of the complexities to a wider audience. The image of the indomitable Mum Shirl on the steps of Sydney Town Hall framed by the eclectic Victoriana facade with various police officials in the background, was taken, we are told, at the request of Mum Shirl who was about to excoriate the police over the scandalous numbers of deaths in custody. This was 1988, the year the Royal Commission into Aboriginal Deaths in Custody handed down its Report. It was also the bi-centennial year which Aborigines masterfully turned into a celebration of survival. The photograph of Gary Foley and others at La Perouse preparing for the triumphal march into Sydneys CBD of Aborigines from around Australia on 26 January that year, is typical of the Gemes archive that gives witness to the unfolding of events. Here the eye travels from the confident figure of Foley on the right, around the dramatic sweep of the We Will Survive banner on the sloping grasses, down to the waters edge, the whole picture dotted with people taking a breather before the action. These images are both portraits and social portraits: they testify to individual effort, they also show group action. Some of these images have been used in the Koori and mainstream presses; some have been shown in activist exhibitions such as After The Tent Embassy (1982, curated by Wes Stacey and Narelle Perroux with commentary by Marcia Langton). Many have never been publicly shown before. Although the most recent material in the exhibition reveals an attempt to update the record and explore a more conventional portrait genre, the exhibition as a whole serves as a critique of portrait conventions by enlarging the term to incorporate a sense of the social. NPG director Andrew Sayers challenged the photographer to see her activist archive as constituting a social portrait. Remarkably, when launching the exhibition, the Government-vilified community at the nearby Tent Embassy were welcomed into the NPG to perform a cleansing smoking ceremony and welcome to country, as well as didge, dances and song, before a rousing opening speech by Linda Burney, MLA for Canterbury. Burney drew attention to the need to recognise the importance of making visible, through photography, the ongoing struggles for self-determination, the resolution of which will ultimately define who we are as a nation. This was a transformative moment in the short history of the NPG annex brought about by the inspired collaboration of the photographer, the director and the local Tent Embassy community. Proof is a testament to one artists sustained engagement with issues central to contemporary Australian culture. The handsome catalogue and events associated with it will hopefully ensure that the people and moments captured are acknowledged in our future histories. 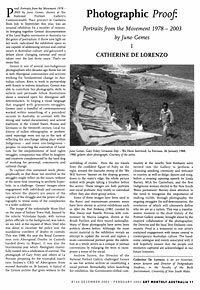 Dr Catherine De Lorenzo is an art historian, senior lecturer and Director of Postgraduate Students, in the Faculty of the Built Environment, University of New South Wales. © Catherine De Lorenzo. Reprinted with kind permission of Art Monthly Australia.